Sunday October 5th I ran my first 5k in at least 12 years. 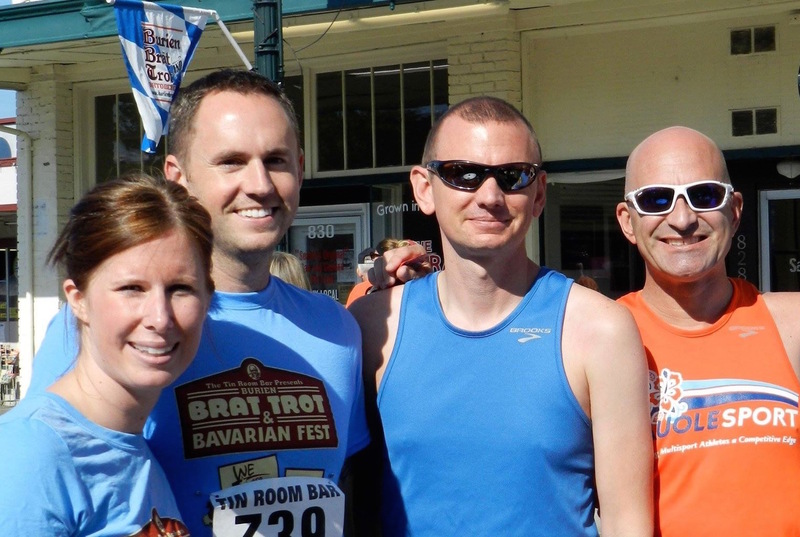 The Burien Brat Trot was a lot of fun (as fun as running hard for 3.1 miles can be). The race had several beer gardens, bratwurst stands, ice cream stands, and tons of activities for kids. According the the race website all proceeds went to the Highline Schools Foundation. In addition to my Wife, Salli, and I running our friends Dustin, and Michael also ran. My 2 boys, Hunter and Noah, watched from the side with Grandpa Talmadge and Grandma Karen. I hope exposure to exercise and races will make a lasting impression on our kids showing them that fitness can be fun and a little competition is good. The race went really well. The winding course was a harder than I thought it would be. My first mile split around was 6:55. My second mile was closer to 7 minutes I think. I tried to press the last mile even with the strong desire to stop around 2.5 miles. In the end my chip time was 21:18 a 6:52 min/mile pace. I came in 20th overall and 4th in my age group. I’m happy with my results, but I still have lots of room for more training. According to the McMillan charts I should be able to hold a 6:23 pace. Even if my speed didn’t increase I can see being able to hold that pace as my weight continues to drop (currently 179 pounds) and my stamina improves. A 5k in 15 minutes never seemed so close yet far away. I’ve improved a lot in the last few months but thinking of dropping another 6 minutes off my time is overwhelming. I’m looking forward to the challenge and plan to push my 33 year old body till I stop improving. 1 Pings/Trackbacks for "First 5k in a Long Time"